Provide an avian family their own striking shelter with this Home Bazaar Ornamental Farmhouse Bird House. The bright white finish, amazing detailing, and cedar shingles on this item are sure to add an elegant look to your home, or create a wonderful roosting spot for small birds when displayed in your backyard. Gothic style, faux windows adorn each side of the house, and pointed arches on the porch and above the side door shape further the theme. Gingerbread detailing on the top soffits adds fantastic architecture to this home, completed by the cedar shingled roof. A 1.25" diameter opening sits beneath one of the gables, for small birds to enter and use this shelter. The deep design of the home keeps birds protected from predators, and the unpainted interior creates a safe environment for nestlings. Two drainage holes on the bottom platform help the nest remain dry, and screening beneath the entry hole creates a ladder, for birds to easily exit the unit. A generous back panel removes easily for nest checks and cleanouts, and gaps beneath the roof overhang ensure the home remains ventilated. An included, decorative bracket attaches easily to the base of this home, allowing it to be displayed on a post in moments. The wooden body and white color keep the home at a great temperature, and the bevy of roof ridges enhances the piece perfectly. 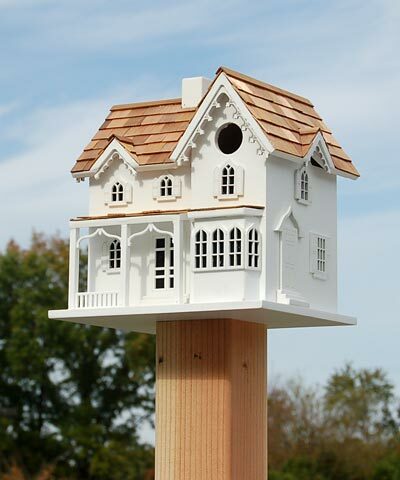 Bring a classic home into your bird garden with this Ornamental Farmhouse Bird House.